William Morris and flowers go hand in hand; whether it be wallpapers, fabrics, the borders of his Kelmscott Press pages or the decoration of a socialist pamphlet, there is always flowers. This is the first time that William Morris's approach to nature and flowers has been looked at in any depth. The outcome brings new insights and a yet deeper appreciation of the range and abilities of this passionate yet practical individual who was in so many ways a pioneer and so sympathetic to our own time. Forests, trees, flowers and gardens were always of prime importance for the man whose floral designs have decorated millions of homes. This delightful book shows how they interlace throughout his life and work. After a short introduction to Morris the book opens with a description of his childhood homes and their large Victorian gardens on the edge of his beloved Epping Forest. It begins with the large idyllic gardens of his parents' houses in Walthamstow on the edge of Epping Forest where the hornbeam pollards were loved and later fought for. Morris the conservationist emerges as one of the early advocates of the use of native species, woodland management and tree protection. Student days at Oxford with Burne-Jones and the important influence of Ruskin and the Pre-Raphaelites come next, and then the book turns to Morris's own homes and gardens; Red House, Kelmscott Manor in Oxfordshire, Kelmscott House in Hammersmith and the Abbey Works at Merton. Here is the list of fruit trees found by Morris in the orchard in which his Red House was so carefully placed, and the order for wattle fencing - fittingly medieval and Chaucerian. In these gardens hollyhocks, lilies, honeysuckle, jasmine and old-fashioned roses flourished in a way that Gertrude Jekyll and the gardens of the Arts and Crafts Movement were soon to emulate both in England and America. Morris's own words and those of his daughter May show his very personal approach to flowers and gardens and how his ideas anticipated the theories of William Robinson and Gertrude Jekyll. 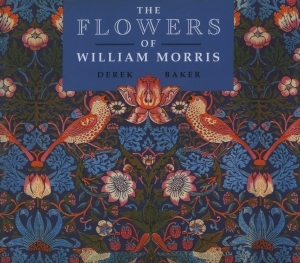 The final chapter takes a close look at Morris's use of flowers in his designs. Morris at his most familiar. The designer of countless wallpapers, fabrics, stained glass and tapestries with floral motifs. Each is different yet instantly recognisable. How close are they to nature? Strangely there is not one drawing from nature known to be by Morris. It seems that for all his advocacy of the teachings of John Ruskin and early interest in the Pre-Raphaelite Brotherhood, his inspiration came more from his beloved medieval book illuminations and the woodcuts in his old herbals. He was essentially a pattern designer and even his doodles are of stylised intertwining stems and leaves. The illustrations, some rarely if ever published before, interlace generously through the text and have been chosen with utmost care. This is a book for all who enjoy reading about gardens, design and an intriguing and live-enhancing man whose enthusiasms still touch so many facets of our lives today.
' . . . and such a garden!' - so ends Morris's ecstatic description of his discovery of Kelmscott Manor, the house on the Thames near Lechlade that he was to regard as his home for the next twenty-five years.